Founded way back in 1977 by composer Stephen Scott, The Bowed Piano Ensemble conjures up the myriad sounds of a chamber orchestra miraculously while employing only one instrument: the grand piano. 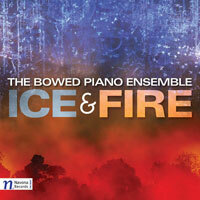 On the back cover of their sixth album, Ice and Fire, the nine members of the ensemble look like a bunch of black-clad doctors hunched over the operating table performing surgery. And that’s precisely what they do: open up the wound (lid of the instrument) and tease out its guts to produce an array of aural pleasantries that nurse our sullied psyches back to health. You are currently browsing the archives for the The Bowed Piano Ensemble category.